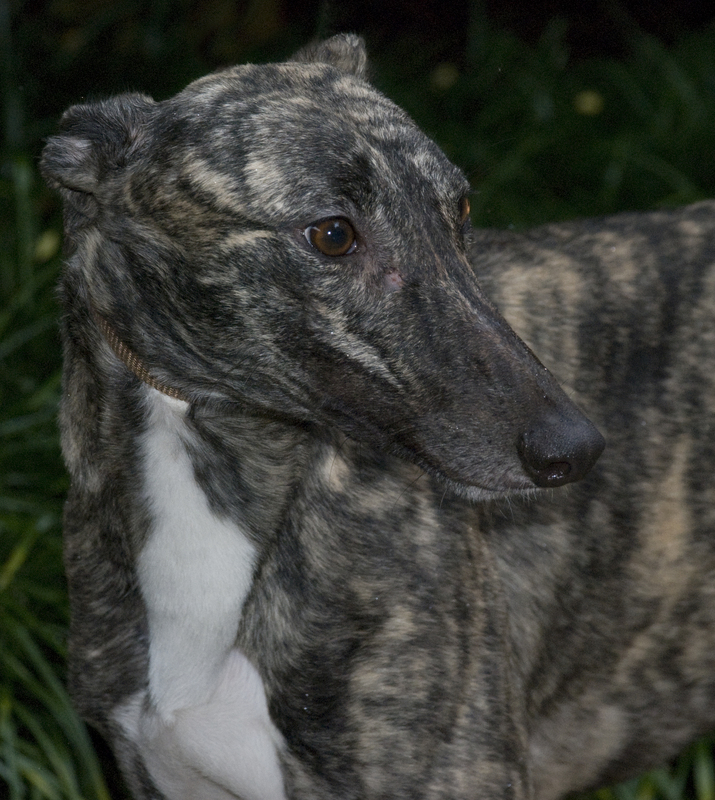 Kimber is a very tiny, friendly girl that is darker brindle. She is short and stocky for a greyhound. Very cute! She is very very outgoing and is a natural sitter that sat a lot of the trip up. She just retired from the Daytona Beach track with her sister Kahr. She had a very short career of 2 races. She is a tiny girl that raced at just 52lbs. She is young and just turned 2 on October 21st. She is a playful, silly girl that will go pounce on toys and throw them around several times a day. She gives hugs and lots of kisses. She is the rare greyhound that will alert you if someone arrives with a bark so wouldn't be a good dog for an apartment. Since she is still young she is more playful and energetic than the average greyhound couch potato. Kimber easily passed her cat and small dog testsÂ and showed no interest in either so we had her listed as good with cats. Since she has shown too much interested in the timid cat in her foster home that hides and runs from her. Since she is not interested in playing with or chasing cats that growl at her or slap at her we changed her to trainable now. She is a playful pup and just needs a home with a confident cat that lets her know who is boss. She will not be placed with a timid cat. Kimber is very focused on people and loves being with her people she is also good with the kids in her foster home. A very sweet little girl.